I left work about three hours later than I intended on a Thursday afternoon, forgetting to pack a rain jacket and my contact lens case while rushing to get to my hotel before its reception closed. With astonishingly and thankfully sparse traffic on the roads, I arrived at my hotel just over three hours after I left Kempten, goosebumps rising when I realized as I stepped out of the car into the chilly 12 °C air that I also didn’t pack a pair of long hiking pants. I was accustomed only to Zermatt being a high altitude valley (all the Allgäu valleys top out around 900 m, with only the Kleinwalsertal rising gradually up to 1400 m at the base of the Ifen), and it didn’t click in my research that my hotel at 1850 m might have temperatures slightly less those I had just left behind. I arrived too late to see the lunar eclipse that night, so after figuring out a solution for my contact lens predicament I headed to bed. The next morning was bathed in brilliant sunshine, resolving my frustration at my poor packing. After a large breakfast and consulting my hiking book I set out for Ranui and the Adolf Munkel Weg (which of course has the totally similar name Sentiero delle Odle in Italian) that runs across the north face of the Geisler group. A missed turn on the twisty roads between the valleys later, I decided to change my goal for the day to the Peitlerkofel. 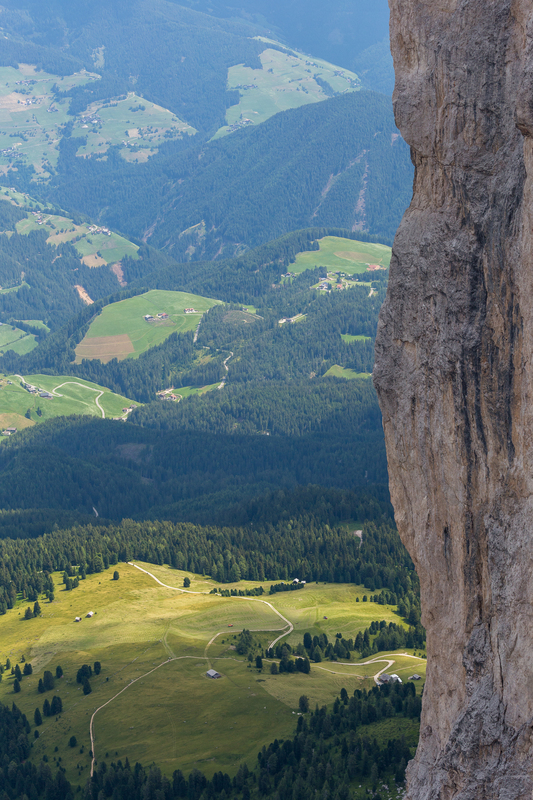 The Peitlerkofel, or by its Italian name Sass de Putia, stands alone at the north end of the Puez-Odle Natural Park and is a fairly popular destination for climbers and hikers alike. I reached the saddle separating the main summit in from its slightly-shorter sister summit in good time and decided to avoid climbing and the groups already queueing up for their own attempts on the peak. 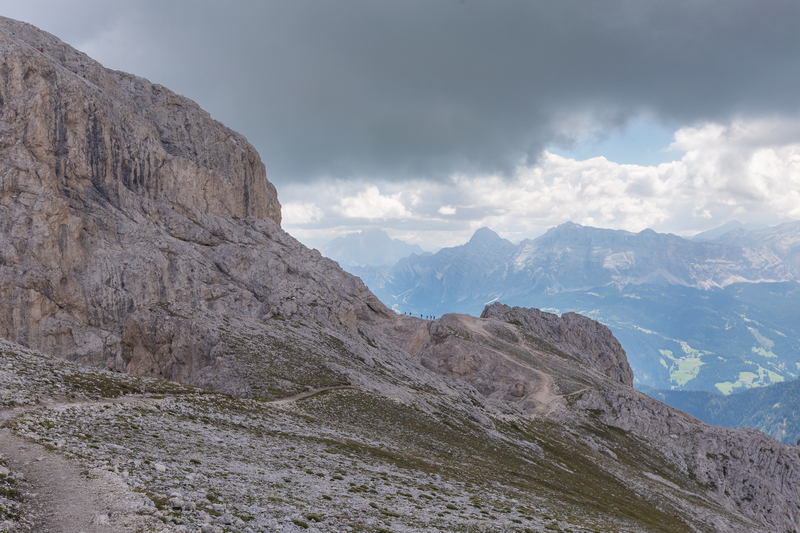 About twenty minutes after leaving the saddle, I reached the hikeable summit of Kleiner Peitlerkofel, clouds already having formed at this point and starting to darken. I snapped some shots of the Geisler range to the southwest and headed back down, quite chipper that I was on a mountain above 2000 m (a first for the season) and that I wasn’t in too bad of shape considering the fairly leisurely paces I had tackled on previous mountains this season. 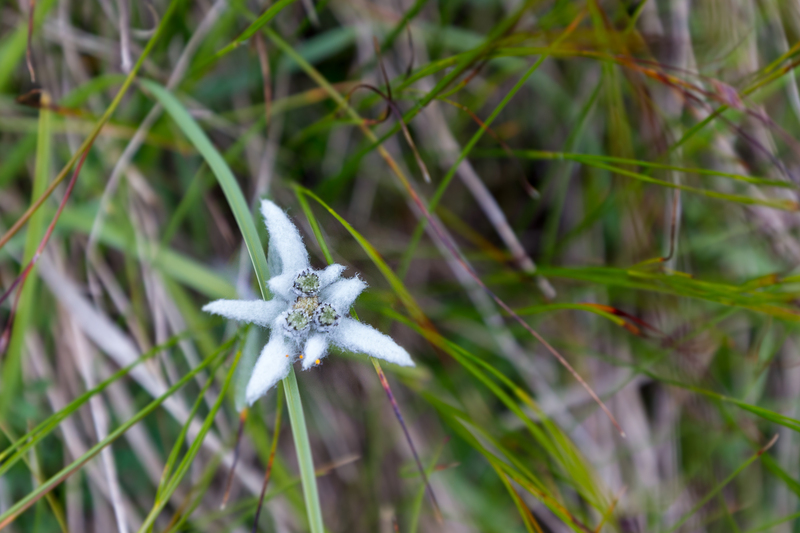 On my way down, I came across a solitary edelweiss. 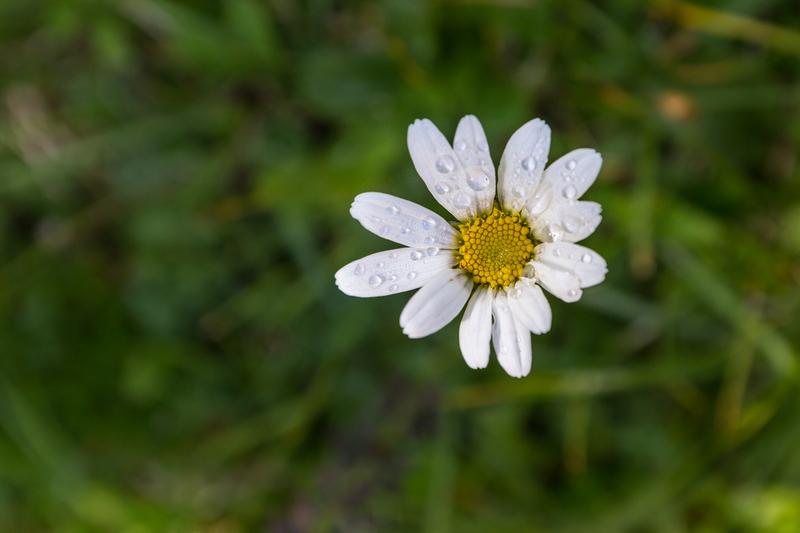 I’ve been on the search for this flower since I started hiking the Swiss Alps in 2011, but this was my first time seeing one. I later saw a second, my last sighting of the day (and of the trip). Somehow seeing the edelweiss gave me renewed energy I didn’t theoretically need, and I continued the loop around the Peitlerkofel content, stopping not infrequently to take in the views and the beauty surrounding me. It had become warm as sunshine broke through the clouds, and despite passing midday the shadows played nicely with the coniferous trees in the distance. In the Allgäu, it seems most of our trees are deciduous, so it was an subtle but interesting change to see predominantly pine tress in this region. Almost immediately after my lunch break, the dark clouds finally opened up, so I stopped under a barn to let the showers pass. Once they did, I kicked up the pace to try to make it back to my car before the next showers, which almost worked. At the hut Munt de Fornella, the rain restarted, leaving me no choice but to get a little wet in the final half hour to my car. I toweled off in the car and set off for Brixen, trying to make it to a drugstore that could sell me a contact case and to an outdoor gear store for a rain jacket while still leaving myself enough time to scout out locations for sunset. I found a pulloff on the road high above Villnöß, noting that this could serve in a pinch if I found nothing else toward the valley floor itself. Earlier this year, I came across a picture of St. John’s Church in Ranui, and it struck me as an extremely engaging shot — religion brings people together, but this church, so isolated against massive mountains, was tiny. I was fascinated by what I imagined as the interplay of religion as an individual, spiritual journey and its social, communal effects that are broadly speaking far from individual. Nevertheless, I don’t typically chase popular locations as the raison d’être for my photography — if my writing hasn’t made that clear, I’m doing something wrong — so put the location out of my mind. 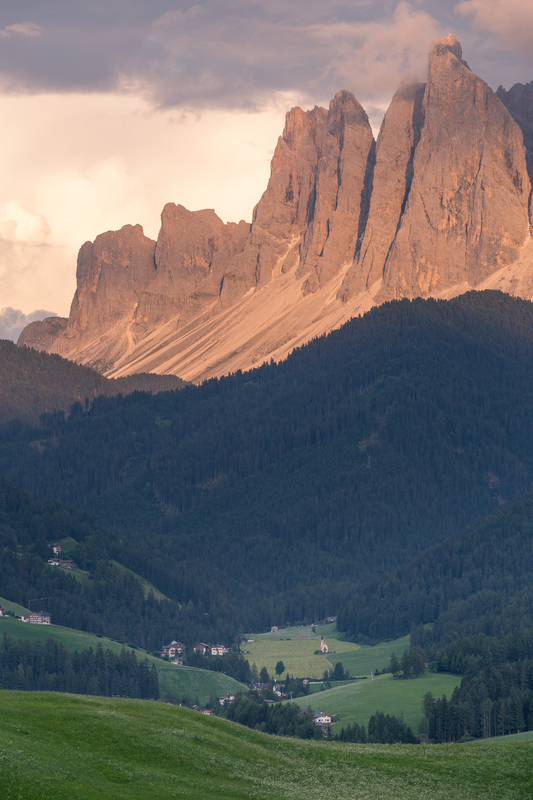 After my original plans to hike around the Drei Zinnen (Tre Cime di Lavaredo) this weekend fell through for lack of hut availability, I looked for day hikes near each other, and only after researching the two hikes I picked out did I find out that my chosen destination was in fact less than 30 km from the church. After a successful visit to and dinner in Brixen to find a lens case and rain jacket, I pulled out the tripod to photograph whatever sunset would bring. As it turns out, the sun didn’t set into a sky ablaze with color, but the scenery was breathtaking regardless. As darkness crept in, beyond the Geisler group it looked as if the clouds were lit from within. 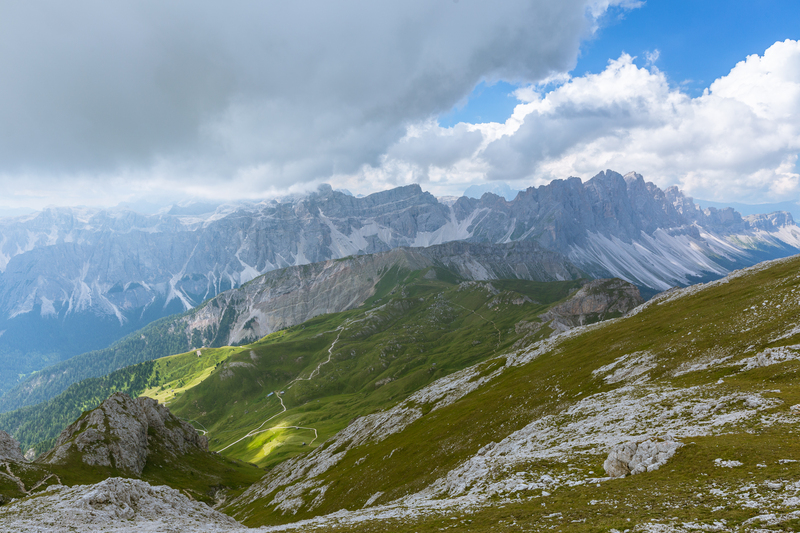 I decided I could give myself one clichéd shot, lining up the Geisler Alps for a panorama as the sun began its descent into the clouds. 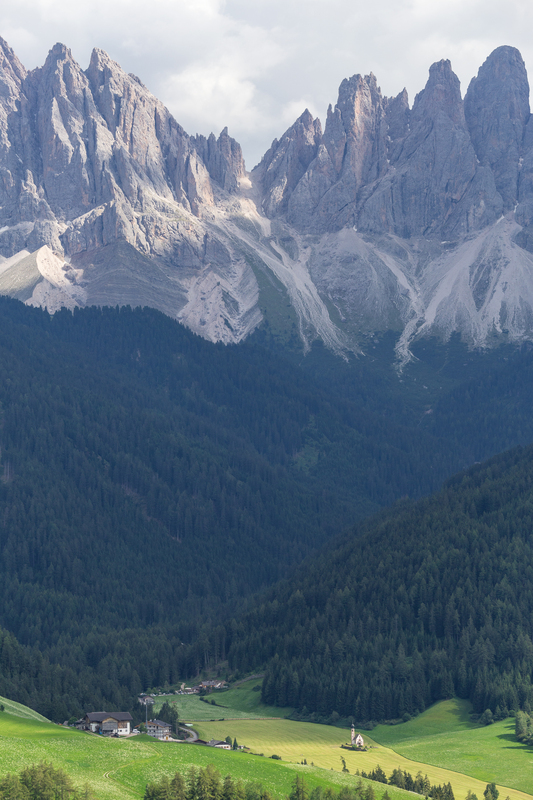 While almost all signage in this valley was posted in both German and Italian, a third language of the region — Ladin — also pops up here and there, and in that language the Italian name of the Geisler Alps, “Odle,” means “needles”. These are nothing like what I’ve seen in the Allgäu and paint a pretty convincing argument as to why the Dolomites are a climber’s paradise. I stayed around for some long exposures, happy to have remained dry for most of the first day. My location was just behind a barn, and I think the cows were quite curious what was rustling about this late at night. They mooed into the darkness a few times, but no one came to meet them. I called it a night after it was clear the moon would stay obscured by clouds, settling in for a decent sleep before a hike that would bring me face-to-face with the needle mountains on my second day. This time I followed the road directions correctly, my target for the day the Adolf Munkel Weg originally intended for the day prior. No matter. I set out rather early, walking by the church I photographed the day before and continuing a climb up toward the base of the Geisler group. The lighting was much harsher the second day, so I mostly kept my camera away from my face, enjoying the scenery and the occasional breeze. A cool shade from rain the night before and reminders of the morning dew seemed to help hold temperatures at bay, but as the sun climbed overhead both shade and coolness became more scarce. The trail was busy, and eventually I stopped trying to figure out whether the Italian buongiorno, German Grüß Gott (or the more colloquial servus common in the Allgäu), or French bonjour was the right language for a greeting, settling on the more boring but seemingly universal “hello” as a way to cover most of the languages I encountered on the trail. This is a popular hiking area, and the gorgeous scenery, well-signposted trails, and endless trekking opportunities made it clear why. As I neared the end of the trail, it seemed like the rain jacket I bought the previous day really wasn’t necessary, though I kept a wary eye on the clouds starting to billow just beyond the mountains. To the northeast, the clouds stayed at bay. 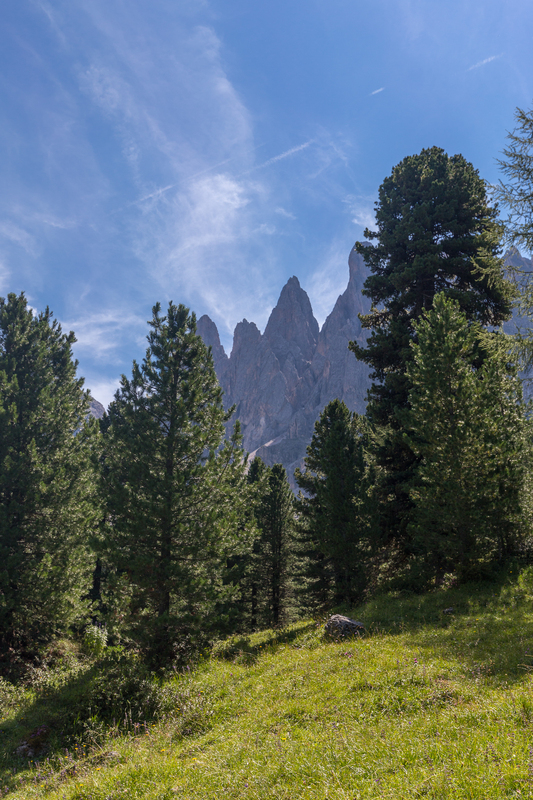 It had been a terrific day for hiking, and despite missing good opportunities to hang out with the gang back in Kempten I was happy I finally got a chance to wander around the Dolomites. 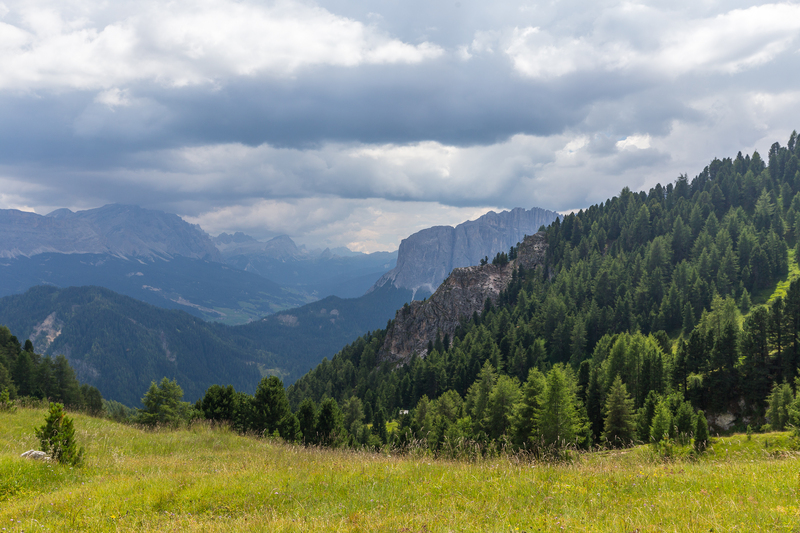 I reached the Zanser Alm, a small hut fed by a massive parking lot to sustain the enormous hiking crowds, deciding to skip a post-hike meal in lieu for getting back to the car before any rains started to come down. I followed the Villnösser Bach, or Rio Funes — yes, even streams have two names — back toward my car, but on one particular switchback I noticed a tiny stream (perhaps the Dussler Bach, which might be the first geographic feature on my trip without two names) with multiple waterfalls. I didn’t have a tripod but managed to shoot exposures of 1/5 s without camera shake, spending at least 35 min at multiple stages along the falls. The whooshing of the water was enough to drown out the sound of falling raindrops, so after shooting only six or seven small falls I put away the camera and on the rain jacket. 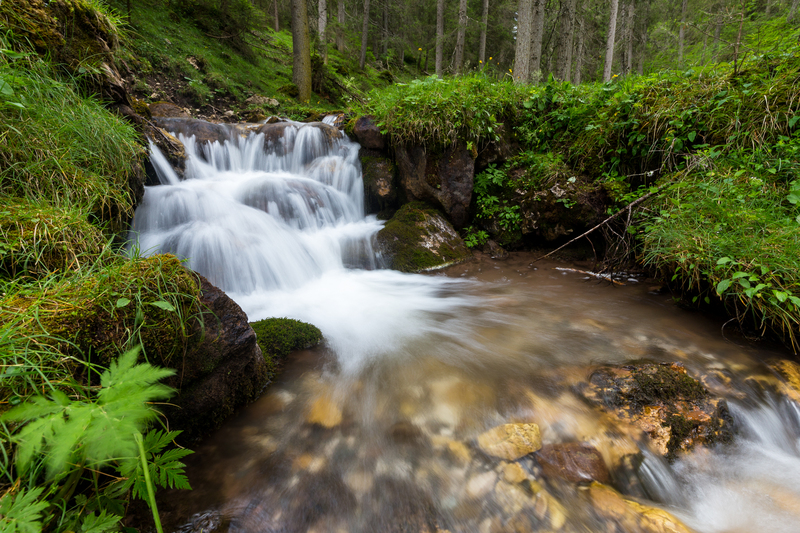 Frankly, I probably could have spent hours following and photographing the waterfalls down to their confluence with the larger Villnöß Bach: the soft lighting afforded by the cloudy afternoon and the lush green combined to offer the best conditions for shooting waterfalls I’ve ever seen. The clouds that made waterfall photography a pleasure didn’t lift, however, which completely flattened the sunset color palette. 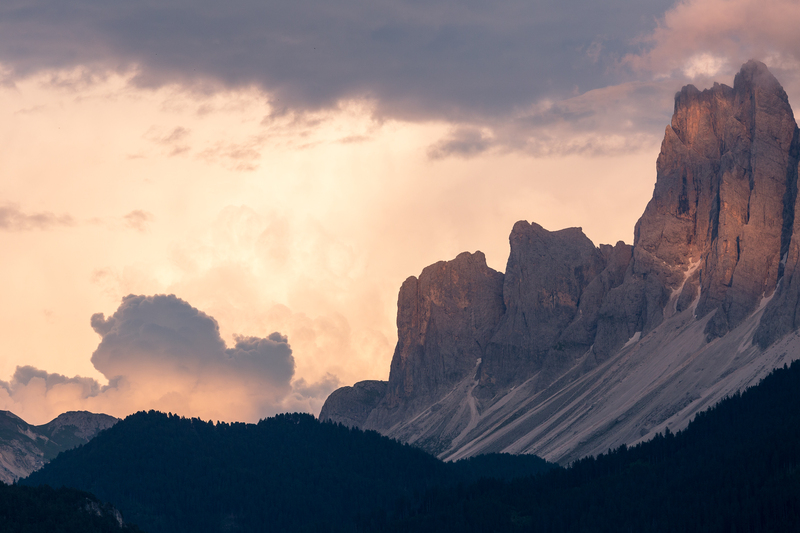 After dinner and hoping for a break in the clouds I reluctantly packed up, disappointed I didn’t have more time in the Dolomites but quite content that I had taken the time to make the trip. 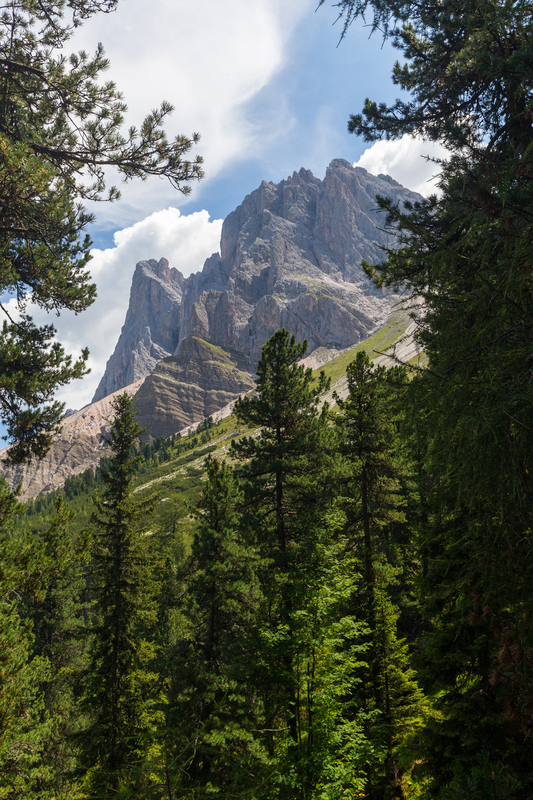 Although they are geologically part of the same Southern Limestone Alps that I had visited three years prior, there really is something special about the Dolomites that seems to make hiking somehow less taxing and the mountains more inviting. The conclusive proof: the return trip, on the same route that I had taken three days prior, took a staggering 5.5 hours (with no restroom, food, or photography breaks), and yet I’d still like to return for another visit. It might be insanity. Or it might be awe, a.k.a. Ehrfurcht, a.k.a. stupore. 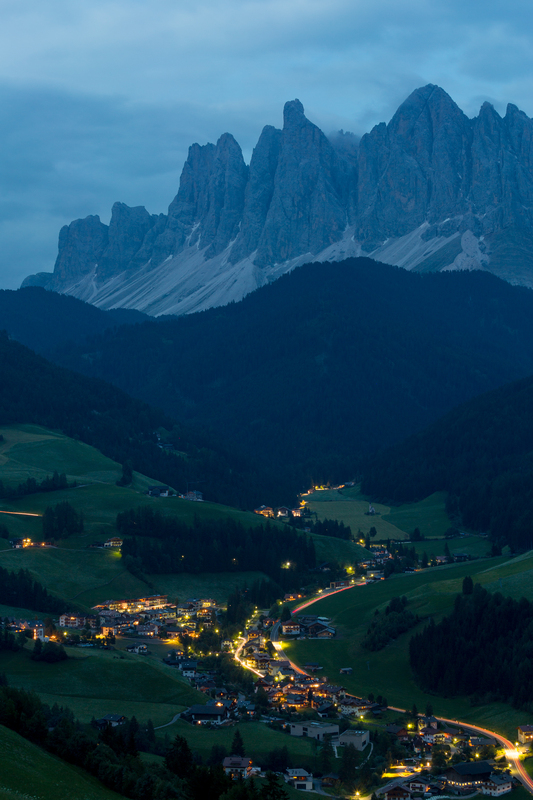 The name for the feeling simply just doesn’t matter, which is probably why so many Europeans go time and time again to the Dolomites without a second thought as to why there’s a second, confusing name for everything.